The current breakdown in bilateral relations between the U.S. and Russia has brought a return to rhetoric and attitudes previously associated with the Cold War. When a group of Russian high schoolers were shown an artificial launching site during an excursion to a Cold War-era bunker-turned-museum in Moscow recently, they were introduced to a simulator that allowed them to make a “nuclear launch.” Given the option of directing their virtual warheads at any country they liked, the majority of them chose to “target” the United States. The episode at the museum, reported on a social network by one of the teachers, whose teenage son also participated in the trip, came as a shock to those who consider the idea of nuclear war between the United States and Russia as a forgotten relic of the past, and even more so to the younger generation, for whom such a notion has never really existed. However, signs of growing mutual distrust are in the air and memories of the Cold War-era nuclear arms race are being reawakened by the current tensions between the U.S. and Russia. However, officials on both sides of the Atlantic seem inclined to put nuclear war onto that list of concerns once again. The U.S. said Russia was violated the agreement by launching a ground-based cruise missile. In response, Russia said that the U.S. itself had violated the treaty by test firing the Ground Based Interceptor, a missile defense system designed to destroy strategic ballistic missiles during the mid-phase of their trajectory, according to Major General Midykhat Vildanov, a professor at the Academy of Military Sciences. In mid-September, U.S. Under Secretary of State for Arms Control and International Security Rose Gottemoeller was in Moscow for a bilateral discussion of the issues of concern relating to the treaty, but although neither side came away satisfied with the outcome of the talks, they have promised to continue the dialogue. 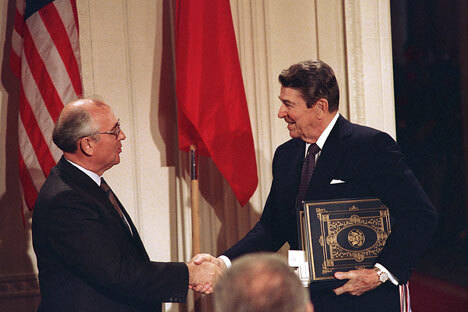 Frank Orban, III, a U.S. State Department official during the Reagan Administration who helped negotiate the INF treaty once called it a "cornerstone of modern U.S.-Soviet/Russian arms control." Additionally, many of the principles and terms of the INF treaty were carried through into the START (Strategic Arms Reduction Treaty) treaty, which makes a possible withdrawal from the INF even more significant. But while many ordinary Russians may have never heard of the 1987 treaty, the country’s nuclear might still gives them cause for pride – a pride that for this generation is not tainted by concern of a new arms race. At the end of September, a group calling itself “Fashion’s answer to the sanctions is ‘no!’” has begun distributing a line of t-shirts with such slogans as: “You make my Iskanders feel funny” and "The Topol is not afraid of sanctions," references to Russian ballistic missile systems. The group is giving the shirts away to those who give up a t-shirt made by a Western company. In compliance with the terms of the INF, the Soviet Union destroyed 1,752 of its analogous missiles and decommissioned 845 launchers, three production facilities and 69 missile bases, while the United States dismantled 859 medium and short-range missiles, 283 launchers, seven production facilities and nine missile bases. But there may soon be new weapons to replace these. Deputy Prime Minister Dmitry Rogozin, who is responsible for Russia's military-industrial complex, recently announced that Moscow is accelerating the renewal of its nuclear deterrence capacities. The project will be completed by 2020. In early October, a U.S. State Department report showed that for the first time in history, Russia had passed the United States in the number of deployed nuclear warheads. Ret. General Habiger is not completely opposed to both countries maintaining nuclear weapons. According to him, “The true of value of nuclear weapons is not military or political: It is to deter other nuclear weapons. As long as nuclear weapons are out there, [there] will be some deterrent value in maintaining nuclear weapons stockpiles,” he said.